The Kanchi Kamakoti Peetham is a 2,500 year-old spiritual institution located in the famed city of Kanchipuram. The serene city Kanchipuram, former capital of the Pallava Empire, is a city of great beauty and spiritual significance. It is one of the Moksha Puri's (cities conferring Moksha or Ultimate Liberation) of Bharatavarsha and the only one in the south. Kanchipuram finds praise as the best among cities of yore through the famous saying: Nagareshu Kanchi. Among the five monastic institutions (at Badrinath, Puri, Dwaraka, Sringeri, and Kanchipuram) established by the great Advaita saint and philosopher Adi Shankara Bhagavadpada, the one at Kanchipuram was ascended by the Adi Acharya, Himself. This Peetham is known as the Sarvajna Peetham or the "Seat of All Knowledge." The Shankaracharya's of the Kanchi Kamakoti Peetham are known for their proficiency in not only spiritual knowledge but everything else imaginable! In fact, there is a famous story regarding Adi Shankara. Before the Acharya ascended the Peetham to be anointed its first Head of the Order, a cobbler is said to have challenged the Acharya's claim to Sarvajna or omniscience. He asked the Acharya whether a religious and spiritual teacher like him could mend a shoe, which he threw before him. The Acharya happily obliged and sat down. He rubbed a cobbler's needle to the side of his nose, after stringing it with thread, and was about to start sewing when the cobbler suddenly collapsed at the Acharya's feet and begged forgiveness, all the while admitting that the Acharya was indeed omniscient. The act of rubbing the needle to the side of the nose, in order to create a film of lubrication on the needle, was a trick used by cobblers. Though this act was commonplace, it was barely noticed by members of the general populace who cared more about the work than something so apparently trivial. On the other hand, the Acharya knew that the needle had to be lubricated first, before use, and did so in the method most characteristic of cobblers. This stunned the cobbler. In the illustrious line of Acharya's who presided over the Matham, the 68th Shankaracharya, Jagadguru Shri Chandrashekharendra Saraswathi Mahaswami deserves special mention among saints of the twentieth century. 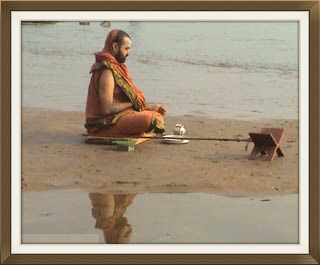 More than human to his devotees, the Acharya single-handedly replicated the great deeds of the Adi Acharya himself. Engaging in Pada Yatra (journey by foot) throughout the country, he took the country by storm and revived not only Vedic, Agamic and Shastric practices throughout the country, but also began a new era in folk and classical music and the other arts. All of these dying traditions suddenly sprang back to life and wherever the great Acharya went, sprouted from seeds of devotion, a generation of devotees who recognized that this soul could be none other than Parameshvara Himself, descended down to rescue Dharma. On the other hand, he arranged for the mass feeding of the poor through schemes like "Pidi Arisi" as well as worked tirelessly in helping millions cross this ocean of worldly affairs. A master of all subjects and the possessor of the Ancient Memory, the Acharya often demonstrated powers, abilities and knowledge beyond worldly comprehension. Yet, he continued to work and pose as an ordinary human Sanyasin among us. He was often called "Nadamaadum Deivam" or "Nadiche Devudu", translating to "the God Who Walks Among Us" by his Tamil and Telegu followers, respectively. The great Paramacharya's incarnation lasted a full hundred years between May 20th 1894 to January 8th, 1994. The Acharya also assured continuity in the unbroken line of the Sri Matham's pontiffs by nominating his successor, Jagadguru Shri Jayendra Saraswathi Swamigal and his grand-successor Jagadguru Shri Shankara Vijayendra Saraswathi Swamigal. The 70th Acharya of this illustrious Peetham, Shri Shankara Vijayendra Saraswathi Swamigal, also known as "Bala Periyavaal," we owe our prostrations to, for continuing the great Paramacharya's work. We lay this website and the work it aims to do in the attempt to achieve the noble aim of preserving Dharma, at the Acharya's lotus feet. May he guide all of us to do what is righteous.